Slack has a killer reputation as a team communication tool, but since it’s free to use, my friends and I decided to give it a shot as a Google Hangouts replacement. We chat across OS X, Windows, Android, and iOS depending on location, so Slack’s multi-platform support was a huge selling point. There were also a few more advantages to Slack. One of the big draws was that Slack has actual apps for every platform. Hangouts is clean, but it has to run in the browser on desktops, so you’ve got to pin a tab in Safari or use FluidApp to generate a dedicated window. Slack was also one of the first apps to embrace the iPad Pro’s screen size with a wider layout, which gave it big points for me as an early iPad Pro adopter. 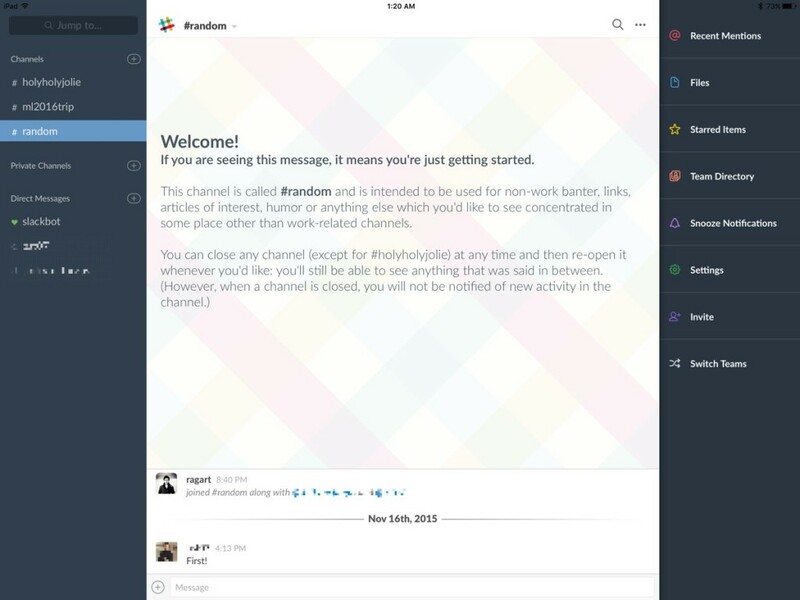 If you haven’t used Slack before, here’s the quick primer. You start off by establishing a team (ex. teamname.slack.com) and then inviting members to join that team. Slack has a very generous free tier for small teams, but the paid tiers allow for fancier integrations with services. You can run customer support and entire teams off of Slack, and the service has lots of little features (notification snooze and @mention notifications) that help it scale from teams of 20–200 people. We didn’t need to scale up because they only things we really send around are a few Dropbox links and images of our stupid faces. The basic tier was enough. Tweetbot 4 is out and it has brought some long awaited changes to Tweetbot on the iPad. The app now matches the visual style of iOS 7–9, which means a flatter overall look with no faux textures in sight. This has definitely removed some of the original charm of the app because the graphics were what gave Tweetbot such a unique “bot” appearance, but there are some remnants of that personality in the sound effects, animation, and of course, the icon. I’m also happy to see that the profile view is as good as ever, highlighting follow status, follower counts, and recent media (a feature I haven’t seen in any other Twitter app I’ve used). Tweetbot 4 is also a good iOS 9 citizen and supports things like Split View, Slide Over, and quick replies within notifications. The app is unapologetic about being an entirely new purchase ($5 now, $10 when the launch sale ends), so you’ll have to pay for this upgrade even if you own the previous versions for iPad or iPhone. I’m totally fine with this approach, as I’d like to keep my favourite developers around by paying them with money. 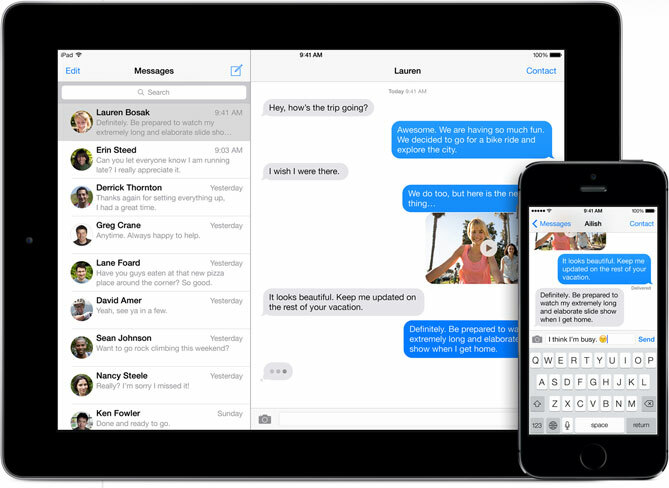 What can you do to keep the Messages bug from crashing your iPad? Apple has been working on a fix for the Messages bug that has plagued iOS 8 devices since being recently discovered by Reddit users. The bug affects text messages, and can render the app unusable. In addition, in some cases it causes iPads to re-boot or re-spring. The message itself is a series of unicode characters that are sent through any app, not just the iOS messages app. The issue arises due to the way iOS 8 handles the display of notifications that contain Arabic characters. Is is unclear why, but the manner in which certain characters are stringed together confuses the app, and as a result, it crashes. 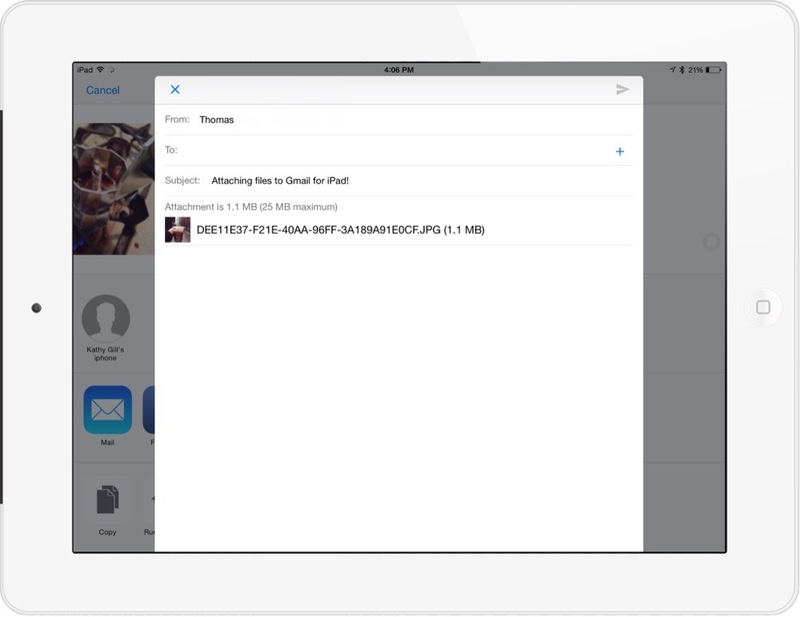 Gmail for iPad just became a better iOS 8 citizen, gaining a few new features to help you utilize the app as your primary mail app (if you’re so inclined). Notifications for new messages now feature an archive and a reply button; you won’t be able to apply in-line like you can with iMessages (Apple doesn’t allow that), but tapping on Reply will load up the Gmail app to that specific message, with the reply window ready. Then there’s the Gmail share extension that’s now available in other apps. If you’d like to send a PDF from within Notability, or a picture from the Photos app, all you need to do is activate the Gmail extension from within the iOS share menu. Once that’s done, you can select the file(s) you’d like to share, and then tap on Gmail within the Share list. iOS 8 still won’t let you select a default app for things like OS X can, but these extensions enable much tighter integration of the Gmail app into everyday workflows. The only app that didn’t play too nicely with the Gmail extension was Dropbox — I tried sending a few messages out of Dropbox, but no links or files ever made it into my outgoing emails. Finally, there’s sharing of files within Gmail with any of your other apps on the iPad via the Share menu. Now you can take that vacation picture your friend sent to your Gmail address and save it straight to Dropbox. I don’t use the Gmail app on a daily basis; I keep it around for searching archived messages that are several years old. However, for big users of Gmail, this new features should feel like a major update. Check them out today! 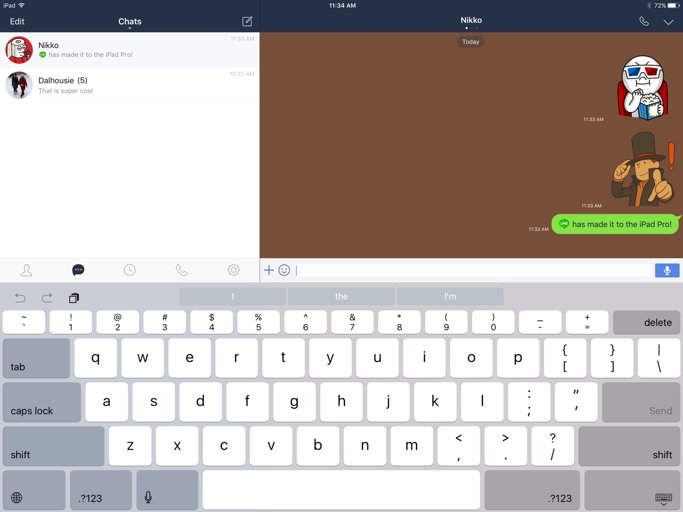 I was introduced to Spout at the start of the week and it was one of those apps that I was immediately wowed by. Pictures won’t really do it justice, it’s the movement and animation that really sell this app. The way to describe it is it is rather like watching a Prezi of your social network feeds. Upon launching the app, you can configure your social network feeds and attach Twitter, Facebook, Flickr and Instagram. Within this you can opt to display certain hashtags. If, for example you put #ipaded into the stream, Spout will only display tweets with this hashtag. As well as this, you can add custom text which will animate. It could be used as a message if your iPad is connected to a screen for example. With the onslaught of digital content, a lot of smart companies have launched news aggregation apps for the iPad in the last several years. Zite and Flipboard are the two news aggregation apps on my iPad home screen, and I tend to favor Zite over Flipboard. 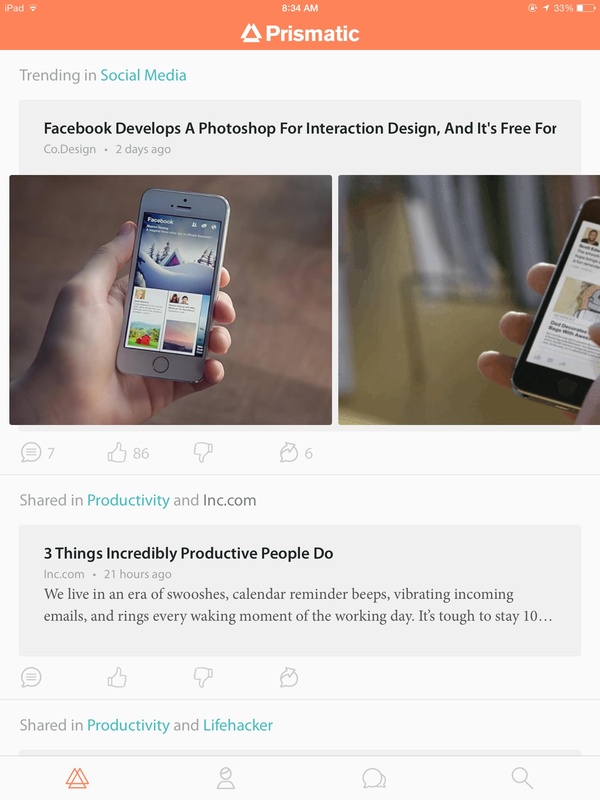 However, I’m always interested in trying a new news aggregation app, and Prismatic is the latest contender. It should be mentioned that overshadowing all of these worthy companies and their apps is Facebook, the 600 pound gorilla, and their launch of Paper for iPhone. There’s no iPad-specific version of Paper yet, but it will certainly arrive soon. For a long time there were no decent blogging apps for the iPad or iOS – and I’ve wished for one for ages. Recently a very promising one called Blogsy came along and I have sung its praises more than once already here. 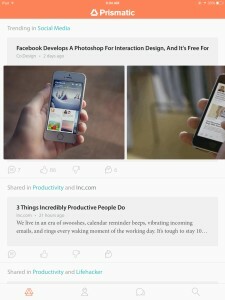 Today I discovered another very impressive new blogging app for the iPad called QuickWordPress. I’ve been using it off and on for most of the day, and it has worked very well for me. My previous post – this one about how the more I use iPad 2 cases the more I love the smart cover – was written and published entirely from within QuickWordPress, and I’ve posted a few other drafts and test posts during the day as well. The App Store description for this app makes it very clear that it is not intended to be a full-featured weblog client, and that what it aspires to be is a powerful tool for writing, publishing and updating posts on the iPad. Based on my first day using it, I’d say the app lives up to that goal. 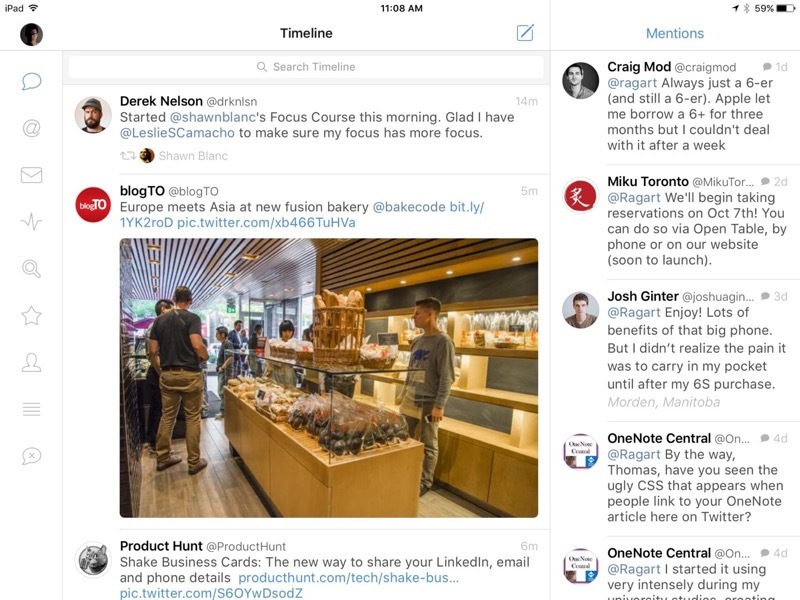 Still looking for a favorite Twitter app for the iPad? Me too. 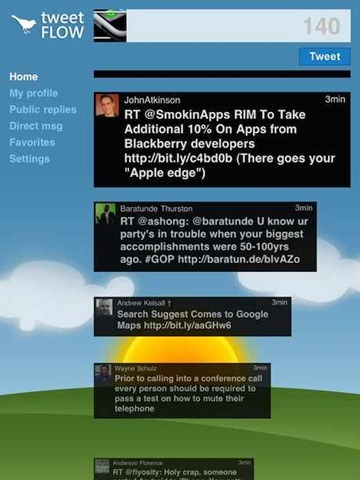 If you don’t need all the bells and whistles and fancy a simple and fresh looking Twitter client, you may want to give Tweet Flow a look. Tweet Flow is not going to match up to the everything but the kitchen sink, feature-rich Twitter apps (for iPhone and iPad) like Tweetie, Twitterrific, SimplyTweet and so on. It is a much more basic client, but with a few nice new twists and a very different sort of look to it. It’s also an iPad-only and custom built for iPad app.